Poland native Ola Makurat has played basketball all her life. 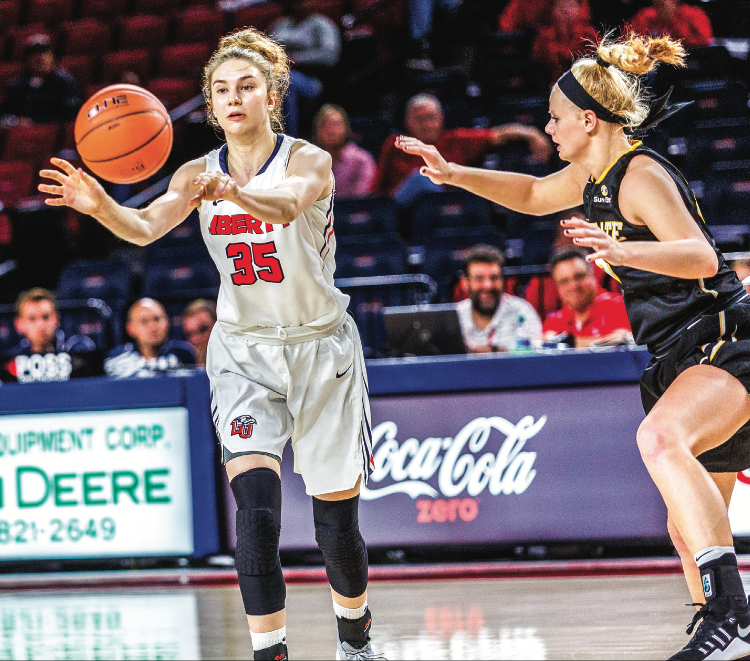 Now she has the opportunity to play NCAA women’s basketball as the freshman guard and joins Head Coach Carey Green and the Lady Flames squad this season. Makurat left her home at the age of 14 to attend Sports Championship School, an all-girls boarding school in Lomianki, Poland, where she lived with 24 other basketball players. The Sports Championship School’s mission was to challenge each player to compete at the highest level. Makurat herself went on to play for Poland’s U-18 and U-20 national teams. Through her experience on these teams, Makurat met Green. After these important matches, Makurat had to take a year-long break due to surgery, but she stayed in touch with the coaches. That year, she prepared for entrance exams so that she could attend Liberty University. In school, Makurat’s English classes focused on grammar and writing, but speaking was not a frequent practice in the classes. She said language has been her biggest challenge since coming to the United States. Though America presents many challenges for Makurat, she is eager to take advantage of the cultural opportunities. Makurat said Green has significantly impacted her first few months here at Liberty through guidance and acts of kindness. Makurat studies sports psychology, but wants to return to Europe to play professionally after college. Eventually, her goal is to be both a psychologist and a personal trainer. She said she looks up to her parents for wisdom and wishes to reflect their hard work and faith. Makurat and the Lady Flames take on West Liberty Dec. 10 at 11 a.m. in the Vines Center. BALL is a sports reporter.